Our Partner Programme is designed to help reward businesses and enable them to share profitably in the opportunity that the cloud offers. As an iomart Partner you'll add significant value to your business. You can benefit from directly integrating our services into customer solutions or simply referring us to your clients, safe in the knowledge that you are recommending the UK’s leading cloud company. So why choose us? 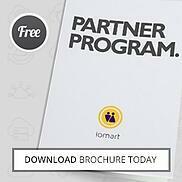 Download the brochure to find out more about the features and benefits of the iomart Partner Program.